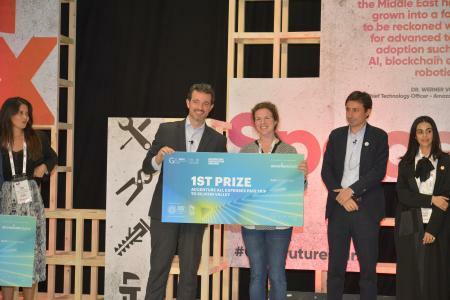 Accenture has recognized leading startups at its second Accenture Innovation Awards held during GITEX Technology Week 2018. The initiative, in partnership with Expo 2020 Dubai, Fintech Hive at DIFC and Etisalat Digital, recognizes up-and-coming start-ups that play a major role in changing and improving aspects of people’s lives. The awards are part of the company’s vision to support emerging talent and identify forward-focused ideas that use technology to solve tomorrow’s challenges. Startups from around the world have applied for the Awards, and shortlisted participants had the chance to present their ideas in front of a jury comprising of senior executives from Accenture, Expo 2020 Dubai, Fintech Hive at DIFC and Etisalat Digital. Winners were chosen across three categories: Artificial Intelligence, Fintech and Social Impact. “Nabta” for their healthcare app that empowers women to manage their own health by seamlessly integrating traditional forms of care with the latest technologies. “Slidr” for their e-commerce marketplace which uses a dynamic pricing technology that analyses consumer behaviour patterns and decides price reductions accordingly. “Nabta” for their healthcare app for women that empowers women to manage their own health by seamlessly integrating traditional forms of care with the latest technologies. Yousuf Caires, Vice President of Expo Live – Expo 2020 Dubai, said: “As Expo 2020’s innovation and partnership programme, we share Accenture’s enthusiasm and its vision to encourage the use of technology to positively impact society. As the proud supporters of 70 Global Innovators from 42 countries, we are constantly inspired by the impact that these creative solutions to global problems are having. “We believe that innovation can come from anyone, to anywhere, and we are especially excited to see more social innovators from the region participating in the current cycle of our Innovation Impact Grant Programme. They can apply at www.expo2020dubai.com/expo-live/Innovation#how-to-apply.” he added. Francisco Salcedo, SVP, Etisalat Digital said: “We support the ecosystem of innovation by providing the tools that accelerate the growth of companies with Etisalat. That´s why we have launched Future Now in GITEX 2018. We look forward to working with the winners of ‘Accenture Innovation Awards’, by giving access to our robust network and digital platforms to build viable products and new revenue streams.